The ideal choice for a start-up business. Offering a non-stick upper heat platen, which offers a stable and even heating working performance. 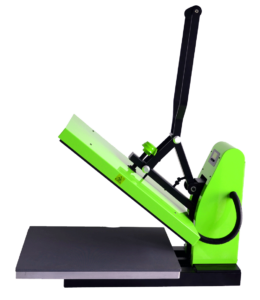 It is a good choice for those customers looking for a stable quality heat press with a competitive price. The full series machine can be used in DTG printing and heat transfer film applications. Solid Welded Structure: State of the art welding, which offers the machine a strong and stable structure. Over the Centre Pressure Distribution: The pressure source is strategically placed over the center of the upper platen and uses struts to drive the pressure out to all corners. The results is an even and heavy duty distribution of pressure that is unmatched by other heat presses in the market today. Cast-in Tubular Heating Element: The tubular heating element is cast into the aluminium upper platen, heating the metal from within. The element is coiled throughout the upper platen to provide a reliable and even circulation of the heat to all corners.